SEO, or Search Engine Optimization, is an important component of any good website design. Yet many times when I speak about SEO to business owners, they still don’t know what it is or why it is necessary. Every web page has two sides: the side which is seen by human visitors to your website (sometimes called the front-end), and the code behind your website which determines the content, the layout, and how it will be displayed by browsers. Many incredibly beautiful sites on the web have inferior coding or don’t take advantage of the code-based SEO opportunities available to them. Flash-based websites are great examples. They look great to human visitors, but are limited in their search engine optimization capabilities. This is how a website looks to humans. On the other hand, many websites look terrible but get excellent rankings on Google because of their superior SEO. Great SEO is important, but not at the expense of professionalism and the ability to close the sale through your visual presentation. Kropmark Design helps businesses take maximum advantage of their online marketing by creating websites that are attractive to customers and search engines both. After all, what is the advantage of having a beautiful website if no one will ever see it? Search engines rank your website based on two main criteria: relevant content and inbound links. Relevant content is established by having good copywriting that is rich in the keywords that your customers use in searches. Your site needs enough keywords to be found by Google, but not so many that you get penalized for artificially adding them, also known as “keyword stuffing.” As a result, websites with an abundance of well-written text will outperform websites with minimal content. This is why we recommend that businesses include a native blog component, updated regularly, into their websites. This is how a website looks to search engines. Maximizing the presence of keywords within your html code is also key. Many business owners ignore file names when uploading photos to their blog or website. Humans who view uploaded photos on your website won’t ever see this filename, but Google will be able to read it in your code. The Colorado Springs SEO value in a file named colorado_springs_web_design.jpg is significantly greater than a file named 92b54h5.jpg. Renaming your files effectively is an easy way to add greater relevance to your website. 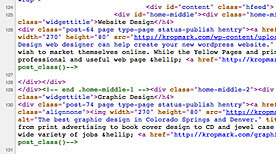 Kropmark Design can help you with many similar techniques such as utilizing alt tags, writing strategic link and title copy, and using effective meta keywords and descriptions. Inbound links to your website also raise your prominence in search engine results. Websites which have longevity, a good reputation, and are considered worthy of linking to by the online community are assigned greater value by search engines in website rankings. Most businesses want to get listed on the first page of a Google search the day their business opens, but off-site search engine optimization is a process that is best done over time. Registering your website on customer feedback websites and getting good reviews on these sites is very helpful. Linking to your website from online directories and submitting your blog to aggregator sites are also great techniques that Kropmark Design can implement to get you noticed on search engines like Google. Opinions about best practices for search engine optimization cover a wide spectrum. Those practices which are condoned by search engines are called white hat SEO services. Techniques that are discouraged by search engines, or that use deception to accomplish better rankings, are called black hat SEO services. Some companies are looking for a quick fix that will get them ranked immediately. They contract SEO companies to trick search engine algorithms by creating artificial links and spam. However, Kropmark Design believes that white hat SEO techniques have greater payoffs in the long run and are also more ethical. Additional avenues to increase your online presence include video marketing, social media marketing and pay-per-click advertising. 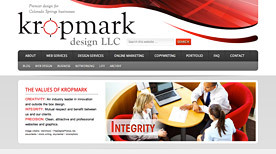 Kropmark Design is an all-in-one online marketing company and can help you with any of your web marketing strategies. We can copywrite your social media posts and blog posts, optimize your content and code, and provide you with a beautiful website that will convert your customers into sales. Get found online. Call Kropmark Design today at 719-465-4599.